Milroy Goes is a self-taught filmmaker who has proved that conventional education does not necessarily translate into success. This son of the town of Cuncolim has come far from making short films shown at IFFI (International Film Festival of India) to having his film Welcome M1LL10NS selected as part of the general category at the 91st Academy Awards. 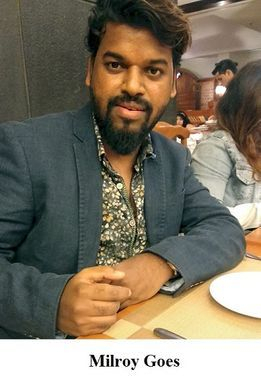 Since 2008, Milroy has been making films, beginning with short films like Unexpected that was shown at the Chota Film Centre (IFFI) in 2009 and gave him much needed confidence to continue. The Chota Film Centre specifically showcases Goan talent. The film was remade as Expect the Unexpected in 2011 under the mentorship and production of French national Anthony Coombs-Humphreys. Anthony and his wife Christine were supportive of Milroy, enabling him to hone his filmmaking skills and encouraging him to take a step in the direction of Bollywood. In 2012, Milroy directed a Konkani film featuring Razak Khan and Deepraj Rana, who are well-known Bollywood character actors and Indian television actors. The film was the first digital Konkani film shot entirely with a Canon EOS 7D. Eventually Milroy met with Manpreet Singh of Manna Mohie Films, UK. After being interviewed by Manpreet Singh and Balbir Begampuri, a film director from Punjab, Milroy’s experience and knowledge in filmmaking was deemed fit to have him signed on to the company’s production. Milroy also has other short films like Peon: Ek Chaprasi, music videos and an advertisement with Australian cricketer Brett Lee to his credit as a director. Welcome M1LL10NS is inspired by true events and tells the story of Alfred D’Souza who is conned out of his money through lottery fraud. It dwells on the inefficiency of a fairly new and poor cyber cell system. The film is loosely based on a true life incident that took place in 2014-15, when cybercrimes were rare. ‘Most of it is fictional and partly inspired by the true event. It took me a while to work on the script and nearly two years to complete the film,’ says Milroy. Bringing together actors from Goa, Punjab, London and Los Angeles was one of the challenges faced by Milroy. Being able to communicate effectively to bring out the best in them as actors was essential even though the script had obviously enthused them. Other challenges were getting on board the famous international band Michael Learns To Rock and the post production at Kochi. “It’s Gonna Make Sense” by Michael Learns To Rock features in the movie, and band member Mikkel Lentz has contributed to the background score. Of the film’s selection to the Oscars, Milroy says, ‘I wanted to take the movie to the global audiences. The Oscars was the answer to the vision we had. I was very happy to be received at Los Angeles and have our premiere in USA.’ The film had a public screening at Laemmle Theatres in Los Angeles and was considered for the general category because it was a multilingual film. It was the only Indian film to make it to the general category at the Oscars in 2019.